A Super-user Admin account that gives you the option of managing current awareness on behalf of your users, if they so wish. "Admin" users can manage (add, remove and update) all the user accounts and journals that have been registered with your customised service. "Admin" users can act as a super-admin-user and set up a personalised web and email based scholarly journal Tables of Contents alerting service for their patrons, with ease! The admin account of a customised JournalTOCs version can register new accounts using personal email addresses. Those of your users who prefer to use their personal email address (gmail, yahoo, etc.) instead of their official institutional email address, can be recognised as part of your institutional customisation. In the case of Digest Alerts, sometimes various alerts for the same journal have been recorded in the Digest Alert as articles become available during a period of time. This is prone to duplications. Or sometimes, the Digest Alert contains entries that may be irrelevant for the user (e.g. Announcements, Index of Authors, etc.) To deal with these cases, the super-user can set the Filtered & On Demand option for the specific user account. This option gives the super-user the opportunity to edit the content of the Digest Alert before it is emailed to the user. So duplicate and irrelevant items can be removed from the user's alerts and only it's sent what is really new and relevant. Once you have selected Filtered & On Demand (Managed by the super-user), the system will display the Manage Alerts link, from where you will be able to edit the content of the user's alert. The email alerts include institutional full-text URLs (e.g. openURL, ezProxy or WAM URLs) only for the journals for which your institution has full-text access. For the rest of journals, users are provided with the URL of the journal homepage so they can go directly to the publisher site and read the abstracts. Furthermore, super-users can request that the email alert of a specific user be redirected to any other email address. This can be useful for example when a user prefers that his alerts be sent to his private email address rather than his institutional email address. 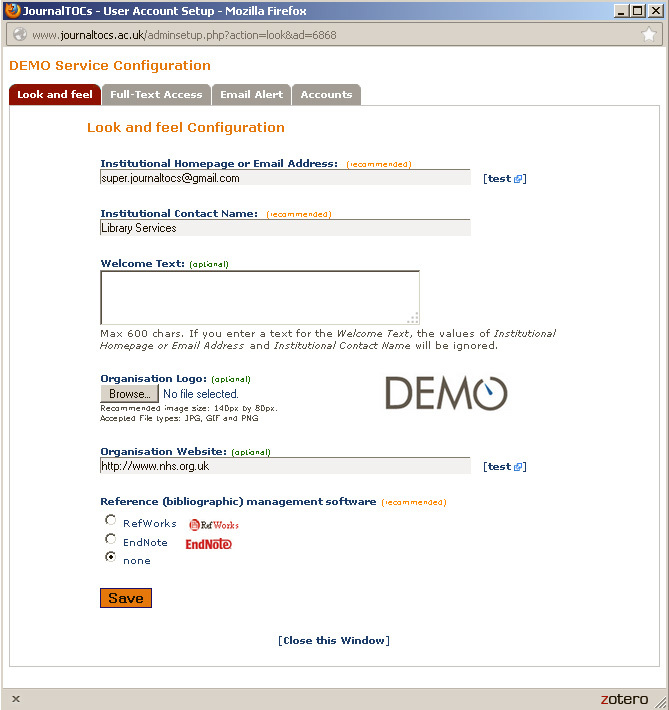 From the same admin window shown above, the super-user can add journals to user accounts using the Followed Journals tab. There are three ways to assign journals to a user: (1) by searching for journals, (2) by using the Suggestions from similar readers feature and (3) by fetching journals from the Dropbox. The aim of these three options is to make easier for super-users the process of assigning journals to their patrons. The logic for the suggested journals from similar readers takes into account various factors such as the most popular journals in your institution, the journals that the user is already following, the subject of the journals being followed by other users with similar journals, journal titles, etc. The Suggestions from your dropbox icon, when clicked, will display all the journals that the super-user has stored in his dropbox, so he could tick the ones he wants to assign to the user's list of Followed Journals. Browse the journals for which your institution has full-text access, from alphabetical lists. This link will intent to give you full-text access via your institutional ezProxy server, your WAM service or your OpenURL resolver, in this order. This link will direct you to your institutional library management system using your OpenURL resolver. When browsing By Subject you will see a column with the number of subscribed journals that your institution has in each subject. Similarly Browsing by Publisher displays the number of journals you have subscribed per each publisher. This extra column is only available when the user is logged in or when the user has been recognised within the IP range of your institution. In addition, you will be able to search journals by subject. 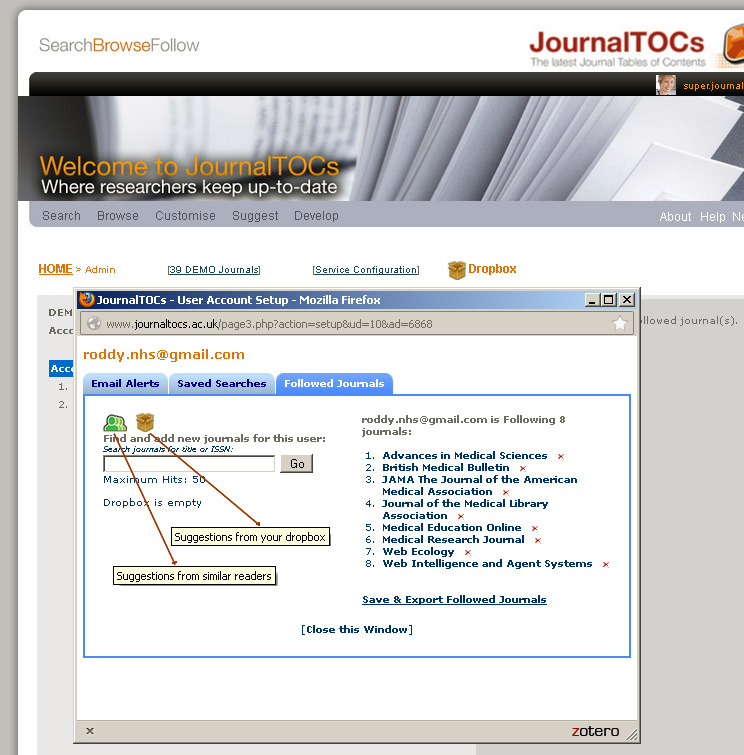 JournalTOCs Premium users can browse, search and sort journals within a specific subject classification. 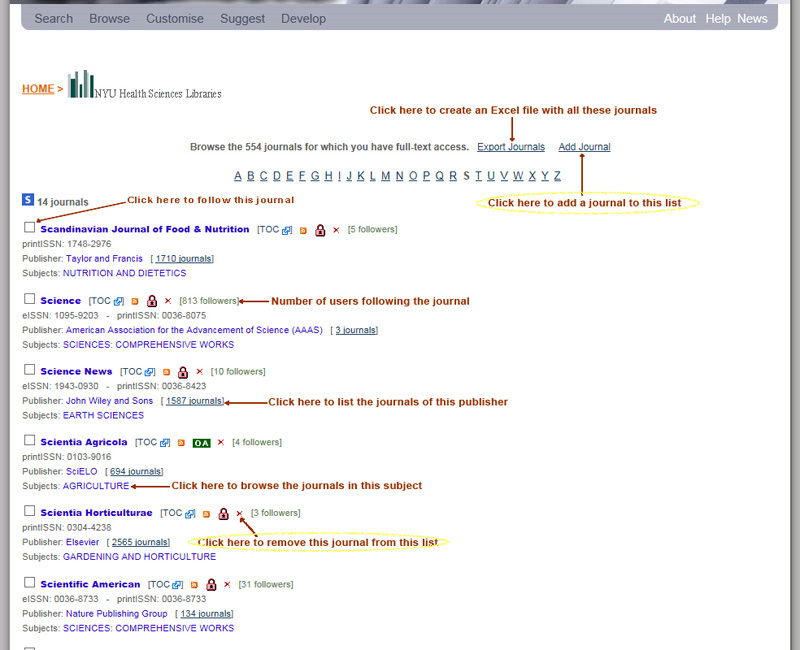 This option is available when the users are browsing journals by subject as shown in the following screenshot. Clicking on Journal Title will sort the journals alphabetically in descending order. Clicking again on Journal Title will sort the journals alphabetically but in ascending order. The same works for Access, Followers, Publisher and Updated. 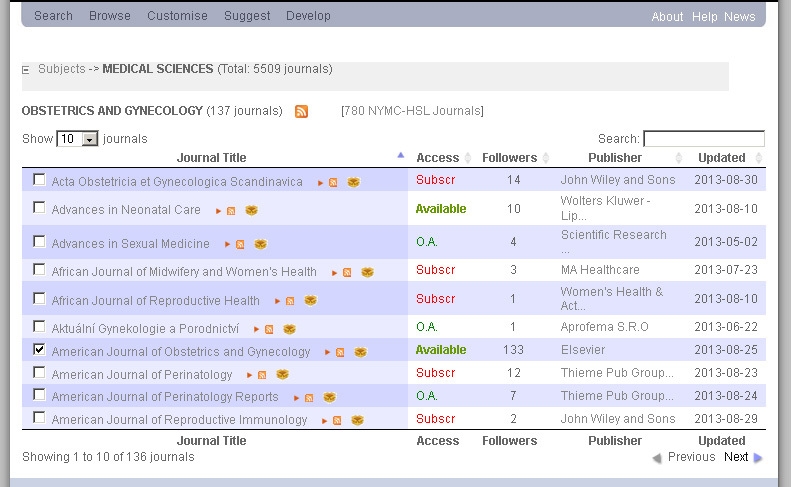 For example if the users wants to know which journals published by Elsevier are the most followed at JournalTOCs, she can enter Elsevier in the search box and click twice on Followers. By default only 10 journals are shown by page, but you can choose 50 from the Show ... journals drop-down list to view all the Elsevier journals, in this subject, ranked by no. of followers. If the user has full-text access for a journal, the Access column for the journal will show Available. Updated displays the last time that the journal has published a new issue or new articles online. If you click on the RSS icon which is located, in this example, between the OBSTETRICS AND GYNECOLOGY (137 journals) and [780 NYMC-HSL Journals] links, you will have the 137 journals in this subject listed in XML format and ranked by their most recent publication dates. You could use this RSS file to create tailored information for your blog or website. For example your developer would be able to select, filter and extract from that list, information that you could use to automatically keep up-to-date your Virtual New Journals Shelf. Super-users can put journals in their Dropbox by clicking on a small brown box icon that is available in the subject lists, as shown in the above screenshot. By clicking on the dropbox icon you will store the relevant journal in a temporary common place, from where you will be able to grab the journals you need, for example to assign them to a user. 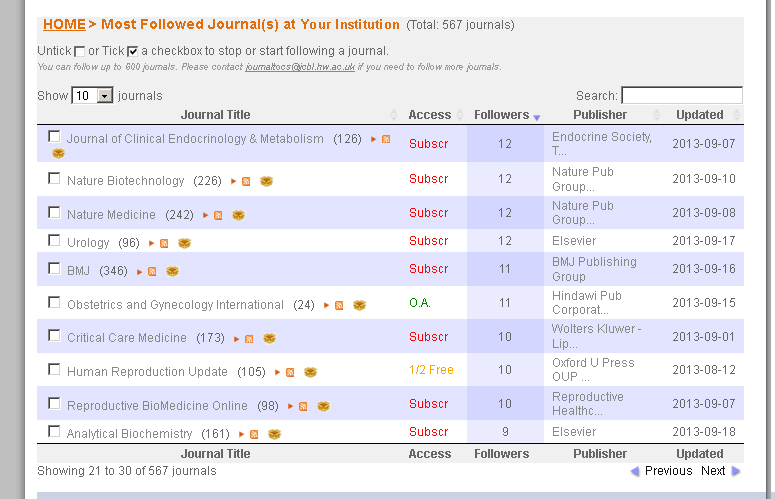 View the journals that are most followed by other users from your institution. In addition to the allowance of 30 journals given to any user freely registered with JournalTOCs, your membership gives you extra 270 journals more, so each of your users can follow up to 300 journals. For full-text access, add OpenURL, ezProxy and WAM links as well as IP authentication to your search and browse results. When using JournalTOCs (searching, browsing, etc. ), the "Full-text Available" icon will always be shown to your users for the journals for which they do have full-text access. Furthermore, the email alerts sent to your users will include institutional URLs for full-text access (e.g. openURL, ezProxy or WAM URLs) only for the journals for which the institution has full-text access. For the rest of journals, users are provided with the URL of the journal homepage so they can go directly to the publisher site and read the abstracts. Customised JournalTOCs Homepage with a unique Look & Feel. Your customised homepage includes your institutional logo, the most followed journals at your institution as well as direct links to the journals for which your institution has full-text subscriptions. It also includes the searches and the articles saved by the signed in user as well as her/his most recent alerts. You can customise your homepage using the Service Configuration Menu, which is available to super-users only. Save your preferred journals as "Followed Journals"
All the features available on the freely available JournalTOCs website are also included in the customisations.